Hatchments, a specific type of heraldic display following the death of someone, though they can be found on display in many churches in Europe, are truly not all that common. In the land that is now the United States of America, they are even more rare. However, occasionally you might run across one. This little gem of an American colonial hatchment was auctioned in 2013 by Northeast Auctions. It didn't reach but half of its estimated auction price, but I couldn't have afforded it even if I'd known about it at the time. 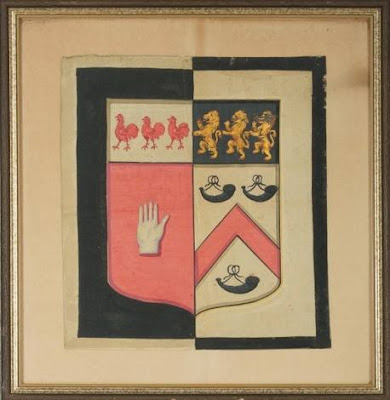 The hatchment is 16" x 14", done in painted and gilt silk. It shows the impaled arms of Hancock and Henchman, and was created for the funeral of Thomas Hancock (1703-1764), a wealthy merchant of Boston, Massachusetts, in August 1764. His wife was Lydia Henchman (1714-1777). Thomas was the uncle to John Hancock (1737-1793), well-known signer of the Declaration of Independence, whose grave marker in the Granary Burying Ground in Boston bears these Hancock arms. Thomas and Lydia had raised his nephew since the death of young John's father in 1744.